A dark and lonely place: thirty pages into three different books. How does this happen? Blame it on the chilly air striking frenzy into my heart. Of the three, I’m most likely first finish Mark Harris’ Pictures at a Revolution: Five Movies and the Birth of the New Hollywood (Penguin, 2008). It’s the shortest and non-fiction, which I always get through quicker than novels. Different tone altogether than Biskind’s Easy Riders, Raging Bulls: Harris’ is less quote-heavy, with less gossip and greater interest in film theory. This leads to some tenuous comparisons between the French New Wave and everyone else, but so far this is a new, insightful take on a well-worn topic. After reading some amazing David Foster Wallace essays and hearing his outstanding archived radio interviews, it seemed time to take up his great monolith. A friend who’d recently started it decided it had too much tennis for her taste, and gave me her copy. The cover of her San Francisco used bookstore first edition hardcover of Infinite Jest looks, quite understandably, like a 1995 screensaver, or what greeted you on Netscape. In an effort to not be the fifty thousandth loser on the Internet to prattle on about this book without having really read it, I need to get deeper in and make substantial progress before I start in with the grand pontification. It is something that can be written about in mid-read, as if reporting from the trenches. Was given a copy of Franzen’s Freedom as an early gift. Why its cover also looks like a 1995 screensaver is a far bigger mystery, though Franzen has said that much of it was written with DFW on his mind, while gobbing Wallace’s fave brand of chewing tobacco in memoriam. So far I’m getting introduced to a lot of characters, and the strings are showing, but the character of teenage son Joey has the potential to hit Chip Lambert’s levels of intrigue. December distractions keeping me from all of these titles: realizing I can still read Hipinion without being a registered user; Black Swan and The King’s Speech; winter curries, soups, and pho; new records from Kanye, Frankie Rose, and Greg Cartwright; 30 Rock on Netflix and Hulu; latkes; morning flurries; holiday parties where the wine flows like wine; the merriment of children. I’ve just finished reading Jennifer Egan’s A Visit from the Goon Squad. Like her earlier The Keep, it’s structured in a way that shouldn’t really work and yet does: The novel jumps around in time over the course of forty years, shifting from third person narration to occasional sections written in the first person (and one memorable use of the second person). There are at least three characters here who could easily carry a novel of this length entirely on their own, and Egan gets her details right, whether her setting is the Bay Area punk scene circa 1979 or NYU in the mid-90s. And she’s able to both pull off a section written as a PowerPoint presentation and make it the novel’s emotional center. As this choice might indicate, it’s now the time of the year when I attempt to catch up on assorted acclaimed novels of 2010; as of this writing, I’ve just begun Paul Murray’s Skippy Dies; recently completed Tom McCarthy’s C, and plan to read Joshua Cohen’s Witz before the year is over. I’ve been on a Don DeLillo kick and I don’t think I even realized that until I began typing this. 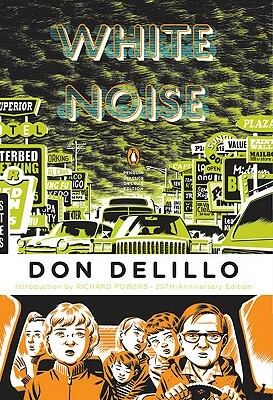 I just read White Noise for the first time since high school for no real reason whatsoever. I definitely appreciated the book far more than when I was sixteen, but it was funniest to see the reactions of strangers when they saw the book I was carrying. At least three commented, “oh, Don DeLillo, I LOVE Underworld!” One of the people was sitting next to me at a coffee shop, another was on the train, and the third was this woman on a plane ride who had a really rambunctious four-year-old. I don’t think I’ve had a random stranger ask me about my book since the time a Hasid asked me what The End of The Jews by Adam Mansbach was about.The inadvertent DeLillo kick continued when I picked up this newest issue of Harper’s, which has a story, by Mr. DeLillo. Hammer and Sickle is about life in a white collar prison. I think I like it. Also read two novellas this week. The first was Lore Segal’s Lucinella — which is part of the Melville House “Art of the Novella” series, and also Diamond as Big as the Ritz by Fitzgerald. I read both of those drinking really good bourbon I bought on sale.